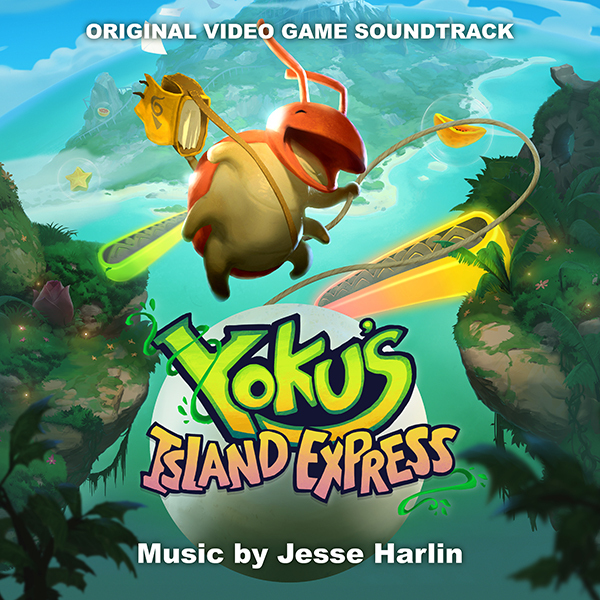 YOKU’S ISLAND EXPRESS – Original Video Game Soundtrack, which features an original score from Jesse Harlin (Mafia III, Star Wars: The Old Republic), will be released on the award-winning video game soundtrack label Sumthing Else Music Works. Yoku’s Island Express is a family friendly, quirky, open world pinball game that allows the player to expand beyond the typical pinball experience. The soundtrack will be available digitally on May 29th, in culmination with the video game release. “Yoku’s Island Express is an adorable and charming oddity. In short, it’s an open world Metroidvania pinball game about a tropical island with a Cthulhian elder god problem. As strange a mashup as that description is, I knew I needed to create something just as charmingly strange musically so that the score could function as a character in the game all on its own. Game players hear everything from beat boxing to bebop, medieval madrigals to chiptune basslines, and sinister reggae to Keystone Kops-styled piano chase music. There’s a song with pinball machine sounds in the percussion tracks, and that same track has banjo, ocarina, talking drum, and a drunken trombone. There’s even one track that uses the DNA sequence of yeast run through a robot-voice generating vocoder as part of the backing track. The score is definitely a little out there,” Jesse said of the game’s outlandish sound. In scoring Yoku’s Island Express, Jesse experienced total creative freedom: “The developer VILLA GORILLA was super encouraging about all of the nutty ideas I wanted to try. I got to just stretch out and run as wild as I wanted with it. They basically said, ‘Just do whatever you want. Just do you.’ And for a composer who’s spent 15 years working with other people’s franchises like Star Wars, MARVEL, Avatar, and Futurama, that was not exactly an easy request to fulfill. I had to go back to those old influences to figure out who I was again. What exactly is my own musical voice? Turns out that it’s kind of quirky and weird, but it works. And in a sense, that’s exactly the same way I'd describe Yoku’s Island Express. It’s quirky and weird, but it works. About Jesse Harlin... Jesse's career in audio spans two millennia. He is currently the freelance composer behind?DunderpateMusic.com?and?SubmersionAudio.com. Before that, he was the staff?Composer/Music Supervisor for LucasArts, a Lucasfilm Ltd. company for 10 years. He's written an alien language, fulfilled his childhood dreams of rock stardom, and written?space pig folk music (no lie). He also wrote the monthly "Aural Fixation" column for Game Developer Magazine for six years. His credits include titles such as Disney parks’ Star?Wars: Secrets of the Empire, Yoku’s Island Express,?Mafia III, Star Wars: The Old Republic, MARVEL's Avengers Academy, and Star Wars: Republic Commando.